Radiopaque, fluoride-releasing glass ionomer restorative. Self-adhesive and self-curing, so it eliminates the need for conditioning, coating or light curing steps. Can be used for restricted stress-bearing Class I and Class II restorations and also placed in bulk, no need for layering. Contains: 50 capsules (20 ea. shade A2, A3; 10 white shade). Ketac Universal Aplicap was evaluated by 27 consultants for a total of 463 times. 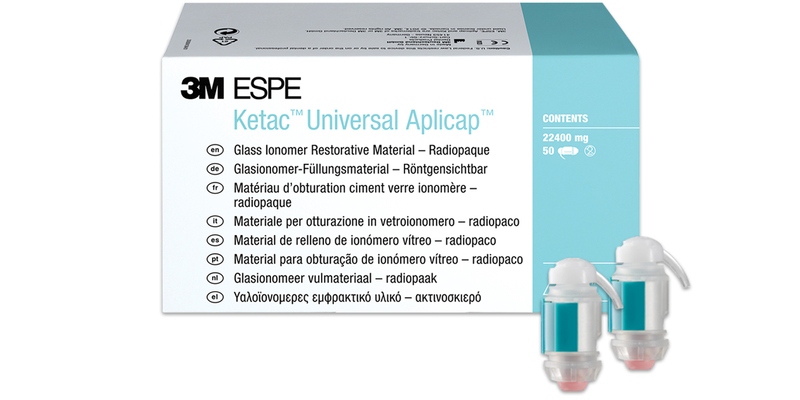 Ketac Universal Aplicap is a self-curing, self-adhering, radiopaque glass ionomer restorative material. It can be placed in bulk, does not require incremental layering, and offers a low level of stickiness sufficient for it to stick to the preparation without sticking to the instrument. It also offers continuous fluoride release for 24 months. Setting time is 3'40" from the start of mixing. With a compressive strength of 250 MPa, this restorative material can be used in restricted stress-bearing areas. Low stickiness for easy placement. Does not require a conditioner or coating after placement. Extended indications for use compared to other glass ionomer materials. Make sure you are ready to dispense and apply it as soon as it is mixed – it sets really quickly. Wait until near the end of the setting time to do any molding. Use a slightly wet instrument to initially adapt the material to the margins. Use a wet cotton tip applicator or pellet to adapt and smooth out the surface. It makes a great protective layer for lost tooth structure placed when prepping for a crown. Trim carefully if using in a core, to avoid gouging the set material.